St. Augustine, bishop of Hippo in north Africa (354 to 430 A.D.), was one of the great minds of the early Christian church, a theologian whose ideas forever influenced both Roman Catholics and Protestants. But Augustine did not come to Christianity by a straightforward path. At an early age he began searching for the truth in the popular pagan philosophies and cults of his day. His young life was also scarred by immorality. The story of his conversion, told in his book Confessions, is one of the greatest Christian testimonies of all time. Augustine was born in 354 in Thagaste, in the North African province of Numidia, now Algeria. His father, Patricius, was a pagan who worked and saved so his son could receive a good education. Monica, his mother, was a committed Christian who prayed constantly for her son. From a basic education in his home city, Augustine progressed to studying classical literature, then went to Carthage for training in rhetoric, sponsored by a benefactor named Romanianus. Bad company led to bad behavior. Augustine took a mistress and fathered a son, Adeodatus, who died in 390 A.D. Led by his hunger for wisdom, Augustine became a Manichean. Manicheism, founded by the Persian philosopher Mani (216 to 274 A.D.), taught dualism, a rigid division between good and evil. Like Gnosticism, this religion claimed secret knowledge is the route to salvation. It attempted to combine the teachings of Buddha, Zoroaster, and Jesus Christ. All the while, Monica had been praying for her son's conversion. That finally happened in 387, when Augustine was baptized by Ambrose, the bishop of Milan, Italy. Augustine returned to his birthplace of Thagaste, was ordained a priest, and a few years later was made bishop of the city of Hippo. 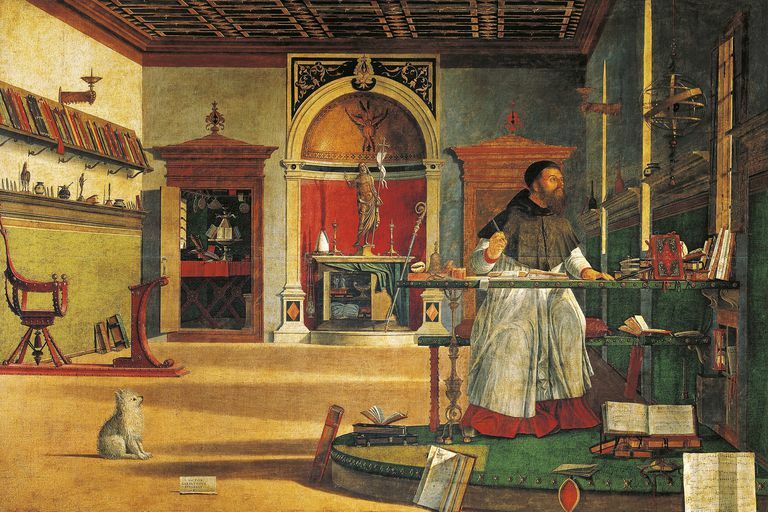 Augustine possessed a brilliant intellect yet maintained a simple life, much like a monk. He encouraged monasteries and hermits within his bishopric in Africa and always welcomed visitors who could engage in learned conversation. He functioned more as a parish priest than an aloof bishop, but throughout his life he was always writing. Augustine taught that in the Old Testament (Old Covenant), the law was outside us, written on tablets of stone, the Ten Commandments. That law could not result in justification, only transgression. In the New Testament, or New Covenant, the law is written inside us, on our hearts, he said, and we are made righteous through an infusion of God's grace and agape love. That righteousness comes not from our own works, however, but is won for us through the atoning death of Christ on the cross, whose grace comes to us through the Holy Spirit, through faith and baptism. Augustine believed Christ's grace is not credited to our account to settle our sin-debt, but rather that it aids us in keeping the law. We realize that on our own, we cannot keep the law, so we are driven to Christ. Through grace, we do not keep the law out of fear, as in the Old Covenant, but out of love, he said. Over his lifetime, Augustine wrote about the nature of sin, the Trinity, free will and man's sinful nature, the sacraments, and God's providence. His thinking was so profound that many of his ideas provided the foundation for Christian theology for centuries to come. Augustine's two best-known works are Confessions, and The City of God. In Confessions, he tells the story of his sexual immorality and his mother's unrelenting concern for his soul. He sums up his love for Christ, saying, "So I may cease to be wretched in myself and may find happiness in you." City of God, written near the end of Augustine's life, was partly a defense of Christianity in the Roman Empire. The emperor Theodosius had made trinitarian Christianity the official religion of the empire in 390. Twenty years later, the barbarian Visigoths, led by Alaric I, sacked Rome. Many Romans blamed Christianity, claiming that turning away from the ancient Roman gods had caused their defeat. The remainder of City of God contrasts the earthly and heavenly cities. When he was bishop of Hippo, St. Augustine founded monasteries for both men and women. He also wrote a rule, or set of instructions, for monks' and nuns' behavior. It wasn't until 1244 that a group of monks and hermits banded together in Italy and the Order of St. Augustine was founded, using that rule. Some 270 years later, an Augustinian friar, also a Bible scholar like Augustine, rebelled against many of the policies and doctrines of the Roman Catholic church. His name was Martin Luther, and he became a key figure in the Protestant Reformation. Confessions, St. Augustine, Oxford University Press, translation and notes by Henry Chadwick.